From time to time, a useful media sharing website closes its doors to users. That was the case with Gabcast.com, a free phonecasting service used by the instructor whose classes I studied for my dissertation. Cinch.fm has been one of my favorite “no-edit podcasting” as well as phonecasting services, and this past week I was saddened to learn they are discontinuing their service. 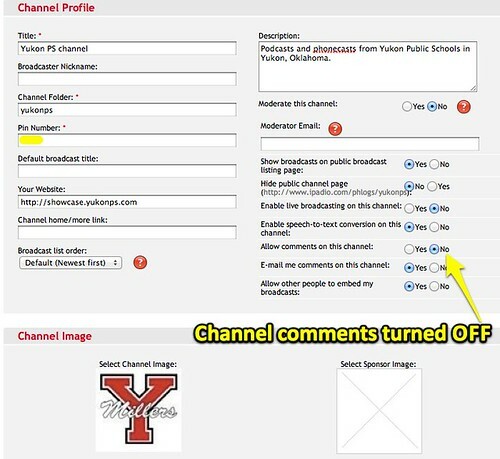 In this post, I’ll describe the steps I used today to cross-post audio content I’d shared online for my school district with Cinch.fm last spring. I cross-posted these audio files (for free) to a new channel I created on iPadio.com. iPadio not only supports phonecasting and app-based audio podcasting, but also uploading of audio files up to 100 MB in size. 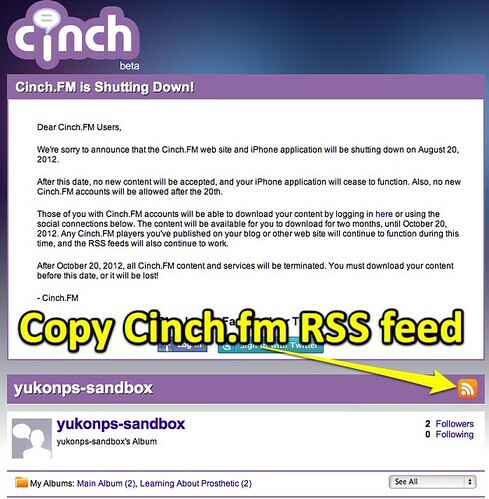 Step 1 is to click the RSS / feed icon on the Cinch.fm channel which you want to download and cross-post. After clicking the RSS / feed icon, click on the iTunes link. 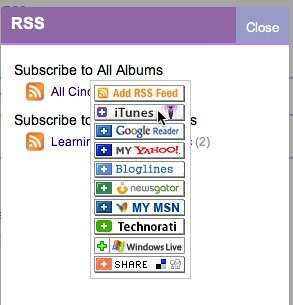 If you have iTunes installed on your computer, this will create a new subscription to that Cinch.fm channel’s RSS feed. 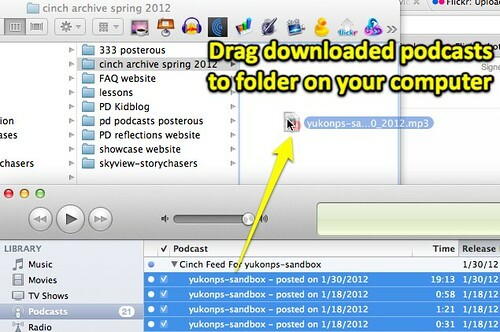 Step 3 is to click GET ALL for the podcast episodes in your Cinch channel. This will download all the mp3 audio files locally to your computer in iTunes. Next, adjust and move the windows on your computer so you can drag the downloaded audio files from iTunes into a new folder. 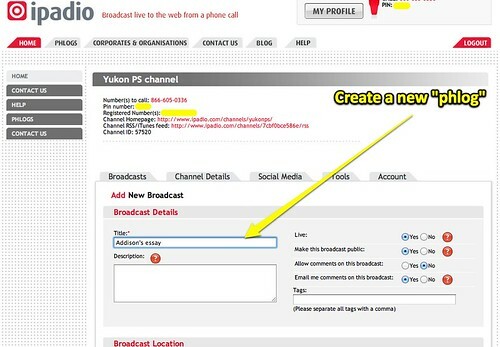 Step 5 is to create a new post (called a “phlog” for phone blog post) on your free iPadio channel. (Create an iPadio account first if you have not already.) Enter desired information for the episode first. 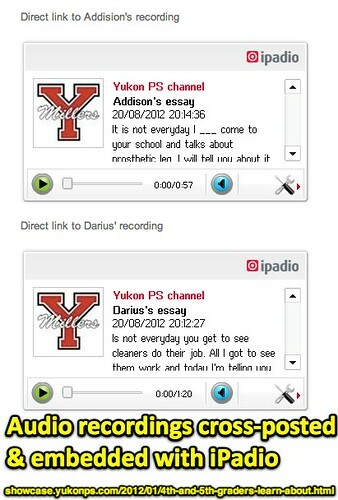 At the bottom of the post, click to select and upload the audio file for that episode. Uploading begins after you click SUBMIT at the bottom of the page. After your episodes are cross-posted, you can embed them directly on your website posts. This is the January 2012 “learning showcase” blog post for our distort which included Cinch recordings, which I updated today with cross-posted audio from iPadio. Do you have other websites and platforms you prefer over iPadio for cross-posting audio from Cinch?